We use the finest collection of real world tracks created by best trackmakers in Generally, including Maciej1, Areen, Sartalas, Spykee etc. 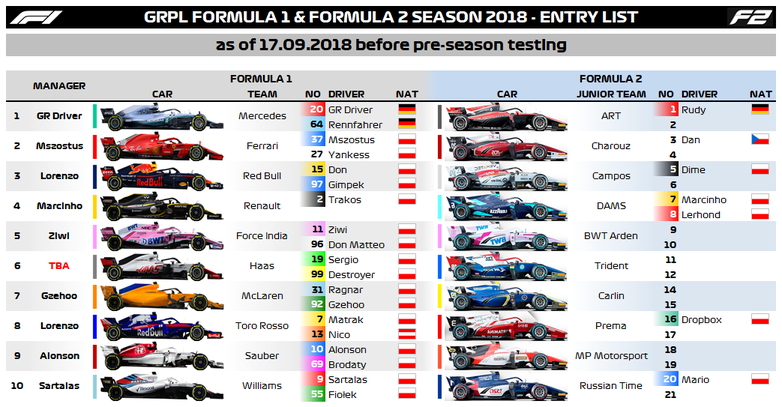 We will drive specifically fine-tuned F1 and F2 cars (Formula 2 cars not yet publicly released). Available on our discord server (link above) under relevant sections (GRPL F1, GRPL F2). Write a post in #zapisy-signup channel according to instructions. List of Team Managers who have free seats can be found in #calendar-entrylist channel. After signing up you will receive you login data from administrator. Great, I will try it! YouTube says that the account was deleted. Yup, it does now after Lerhond's account was changed into GR Polska. apparently I am in. In F2 of course. I'm glad to be back racing after such a long brake. I'll try to steal a few points in the rest of the season. Spielberg. After a long hiatus from front row, GR Driver is finally back on top of the grid. The question remains, can he keep his cool in the race? With such strong competition of world class GR drivers the field is stacked. Can GR Driver overcome insurmountable odds? Find out in this sundays race broadcasted on YouTube! "I´m proud to be back as GR Driver in the world of GeneRally in the year 2015!" 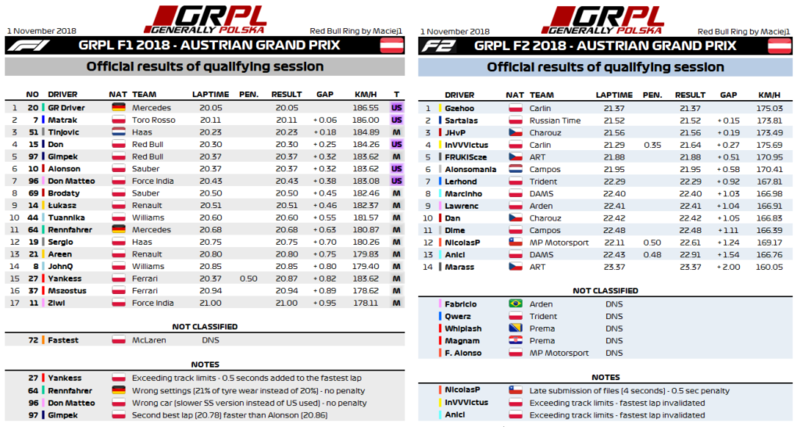 Congratulations to GR Driver and Tinjovic who were the fastest ones on their tyre componds. Notable performance from Gimpek and Yankess and from Tuannika (first TOP 10 appearance in Q and on slower tyres!) 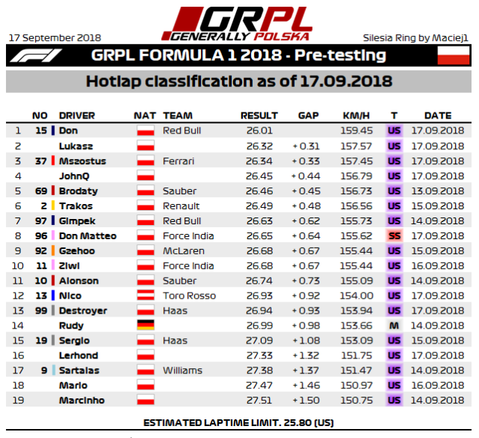 on Medium tyres and Alonson, whose strategic choice of Ultrasofts enabled him to qualify on the highest position so far. We are almost halfway through the season and as you can see, the attendance is amazing and competition is tight in both series. Remember it's still not too late to join! 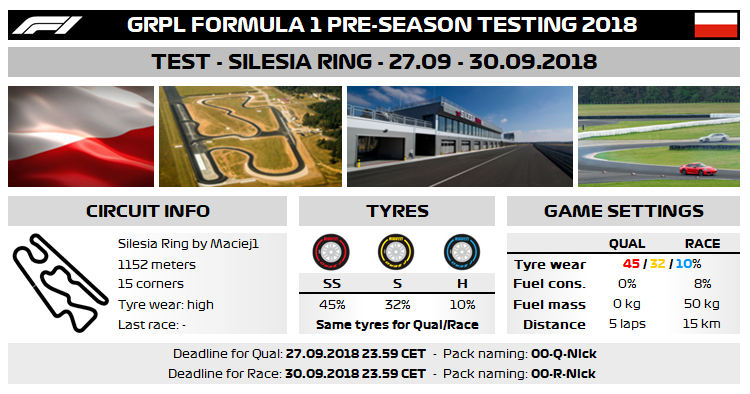 Even for the current race which deadline is this Sunday 04.11.18, 21:59 and 22:59 CET (respectively for F2 and F1). Just curious, How do you merge all the replays into one video? Link in the first post is still valid.